More than $300K was raised for James Robertson on GoFundMe. The Detroit man whose story of walking over 20 miles to and from work daily spurred hundreds of thousands of dollars in donations and a new car has been moved into a new, temporary housing arrangement. "He and a couple of people came to me on Monday and he stated that he had concerns about his safety," Detroit Police Capt. Aric Tosqui told ABC News of James Robertson. "We went into action. "I gave a call to one of the local people in my community I knew and he had something available and was willing to help him," Tosqui said. "I would say the move happened in probably about 20 minutes. We threw his belongings into some garbage bags and that was it." Robertson, a factory worker, moved into the apartment donated by a local businessman on Tuesday. He kept his new car, a red Ford Taurus donated by a local dealership, at a police precinct Monday night until he moved into his new, temporary home. (Ryan Garza/Detroit Free Press/AP Photo) In this Jan. 29, 2015, photo, James Robertson toward Woodward Aveune in Detroit to catch his morning bus to Somerset Collection in Troy before walking to his job at Schain Mold & Engineering in Rochester Hills. Robertson had previously been living in a home with a woman identified in press reports as his girlfriend. Robertson's move was partly motivated by recent reported attacks on local people who'd come into money, according to police. "In Detroit, there were a couple of situations where both [people] were alleged lottery winners and a couple of people had heard about it in the neighborhood, that the people got a windfall," Tosqui said. "He talked to me about one of those situations." 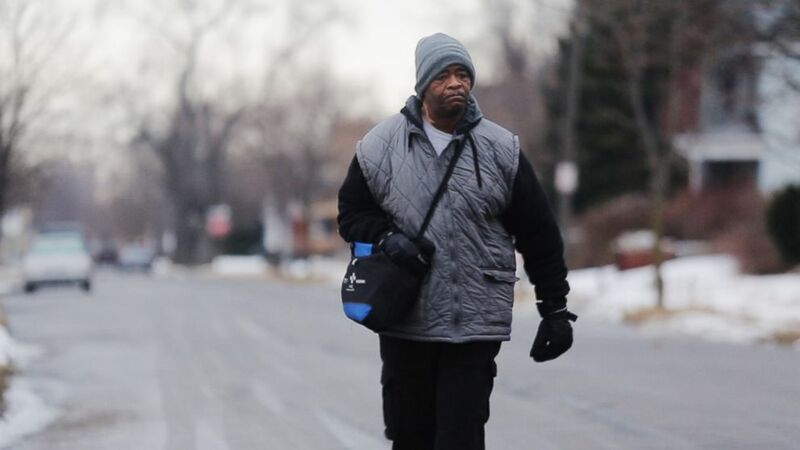 Robertson was featured in a Detroit Free Press article that went viral earlier this month after it detailed his daily 20-plus mile walking commute to and from work. A 19-year-old Detroit college student, Evan Leedy, who read that story started a GoFundMe page with the simple hope of raising enough money to get Robertson a car. The story went viral and the GoFundMe page has now raised more than $350,000 for Robertson, far exceeding the initial $25,000 goal. Robertson has yet to receive any of the money donated on GoFundMe, according to Leedy. “We have a meeting in the coming days and we’ll find out more then about what James wants to do with the money and how he’s going to receive it,” Leedy told ABC News, referring to a four-member team of legal and financial advisers who are volunteering their services for Robertson. That team will now work with Robertson to determine where he moves permanently and how, and when, he receives the money. "Now that his concerns for safety are handled, he is working with them, not police," Tosqui said. "He will have the apartment for a few days, maybe a week. That is between him and the landlord now but the assumption was it was going to be for a very brief time." Robertson is also still working at his $10.55-per-hour factory job, according to Blake Pollock, a local financial adviser who befriended Robertson after seeing him on his daily commute. “His main priority is to work,” Pollock told ABC News. “That’s what it always was before and that’s what it will be. This story has been updated from a previous, Feb. 12, 2015, version.